Main street through Moss Vale, via Southern Highlands. Moss Vale is the agricultural centre of the Southern Highlands, but its rural charm and broad appeal make it an appealing spot to visit. You’ll find wineries and excellent food, enjoyable walks, a pretty golf course and like the rest of the region, charming gardens and historic buildings. It’s the perfect spot to unwind and relax amid rolling farmlands, vineyards, and nature reserves. Spend the day visiting farm markets, having a picnic in a park, or getting a taste of the country at the saleyards or annual agricultural show in March – it’s one of the last old-style country fairs in the area. As one of the two major towns in the Southern Highlands, and the administrative hub of the Wingecarribee Shire, Moss Vale has undergone a transformation in recent years. It is rapidly becoming a hub for independent and creative business, including design stores, cafes and bars. For a smallish town, Moss Vale offers visitors plenty to do. Fancy some birdwatching in the wetlands and reserves? Tick. Golf? Another tick. Browsing antiques and crafts in quirky shops or checking out local art in the town’s galleries? Definitely. And there’s no shortage of regional food and wine to savour in the area. Lovers of excellent food and wine, take a look at the Moss Vale Food and Wine Cluster. The local farmers and foodies have got together to develop a gourmet trail experience of high-quality organic produce and dining. There’s a downloadable map that will show you the way to farm gates, markets, food and farms. A must see in Moss Vale is the stunning Leighton Gardens, especially in autumn or spring when nature puts on a brilliant display. A self-guided walking tour is a top way to explore Moss Vale’s historic architecture. Grab a map at Destination Southern Highlands and discover the region’s colonial and early 20th-century heritage. If it’s a spot of retail therapy you’re after, there’s a decent sized shopping centre with unique specialty shops to visit. Moss Vale has several parks and playgrounds if you have kids with you. Bring the bikes and walk or cycle along the walking path from the town to the Wingecarribee River. Moss Vale can be reached via the Federal Highway and Hume Highways. From Canberra, follow the signs towards Goulburn and Sydney. Once you’ve passed the McDonald’s at Sutton Forest, look for the turnoff to the Illawarra Highway – it is well signposted. Continue driving on the Illawarra Highway and you’ll be in Moss Vale shortly after. 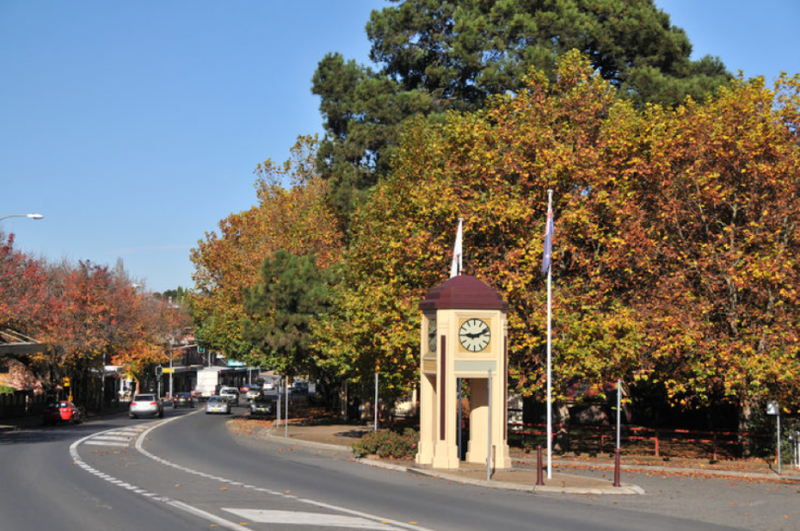 Like many Southern Highlands towns, Moss Vale can be warm in summer and very cold in winter – which means spring and autumn are the best times to visit. Do you have a favourite place in the Southern Highlands? Let us know in the comments.